Compassion Experience, in Tucson, AZ, from May 15-18. We step into a small room in Mathare, a collection of slums in Nairobi, Kenya. The mud-brick walls close in on us as we listen to a young boy describing his life there. Street noises, voices seep into the room, as if it has no walls. The boy’s name is Jey, and he is one of nine children living in poverty in this slum, in this room where they share one bed, close to the floor, hardly big enough for one child. There are various pieces of clothing strewn carelessly on the bed today. Jey explains that the stories of the children born in this slum already are written, and those stories do not end well. Those stories most often involve drugs, alcohol or “changaa,” a drink whose name means “kill me quickly.” It is a drink Jey’s mother makes and sells to earn money to feed her children. Jey also explains that when he grows tired of begging, he begins stealing, which leads him to prison at the age of nine. He invites us to step into the next room and see his prison cell. Fortunately, as real as this adventure seems, my son and I are experiencing it in safety at Compassion Experience, which is in our hometown for four days. Compassion Experience is a set of traveling trailers with the insides set up to realistically resemble key locations in the lives of Compassion graduates from around the world. Visitors listen to each child’s story through headphones, which narrate the tours through five rooms. My son, Logan, in Jey’s “project” at Compassion Experience. As we step into Jey’s dark, bare prison cell, with a dirty toilet in the corner, and food dishes spilled on the floor nearby, and we listen to his continued story, I can feel the hopelessness in the room. But when Jey leaves the prison, and we enter the next room, all hopelessness is gone. He has been registered in the Compassion program, and that next room represents Jey’s Compassion project. It has brightly painted walls, a Bible verse on the chalkboard, a row of toothbrushes hanging in their holder, and a shelf for sponsor letters, representing love from many countries. The joy in Jey’s voice as he discovers he has been sponsored sums up the feeling in this room. He begins to believe that his story actually is written by God, that he is not doomed to follow the same paths of those growing up around him. After visiting three real Compassion projects in Nicaragua last fall, I can say with certainty that this room accurately depicts a typical Compassion project. These projects are positive, joyful places standing in contrast to their surroundings. We continue through Jey’s story, learning about the impact his sponsors had on him, and at the end, we watch a short video, where a grown-up Jey gives us a quick tour of his neighborhood and encourages us to change the story for a child like he was. Letters from sponsors, which are given out to children at their projects. It is a moving experience, and as we volunteer at the event, we see many visitors leave wiping their teary, red eyes. This particular event showcases four stories. In addition to Jey’s story, visitors can learn about Kiwi from the Philippines, Reuben from Bolivia and Julian from Uganda. Each story moves from hopelessness to hope as these real people with difficult beginnings come to know God through Compassion, and He changes their lives. Please consider changing the story for a child like Jey today by clicking here to search for your own child to sponsor. And if you have the chance to see Compassion Experience, don’t miss it! You can check the schedule for Compassion Experience by clicking here. 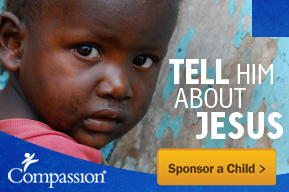 This entry was posted in Compassion International. Thank you so much for sharing your experience!! I’m so enjoying going through these stories virtually through blogs! And maybe one day I’ll be able to see it in person. Hannah – it was a lot of fun! I feel like I waited for years for it to come to town, but it was worth it. I hope it makes it out your way soon!